Frankincense is the aromatic resin or sap from the Boswellia tree. It is tapped from the scraggy but hardy trees by cutting the bark and allowing the exuded resin to bleed out and harden. 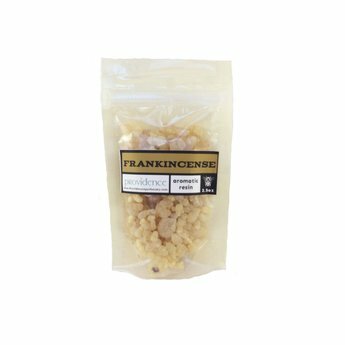 Frankincense is a profound natural material that has a plethora of uses. Modern science is only starting to illuminate the physiological mechanisms by which frankincense relieves arthritis, inhibits cancerous growths, reduces stress-related hormone levels, relives inflammation and enhances relaxation among other actions. 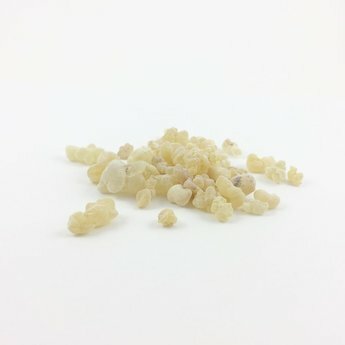 Historically, frankincense has been almost inseparable from religious events because of its reputed ability to help connect one with the gods, gain enlightenment, and focus inward. Its earthy aroma is used to calm and relax. It is used to sanctify spaces and to clear negative energies. Frankincense has been traded on the Arabian Peninsula, in North Africa, and Somalia for more than 5000 years. Boswellia trees are incredibly hardy, sometimes appearing to grow from solid rock. There are 52 references to frankincense in the Bible. Storage Considerations Frankincense tears should be stored in a covered container out of direct sunlight. None known. Use caution when burning frankincense tears as there can be a fire hazard.